This paper looks at the willingness to pay for and participate in a curbside recycling program based on a survey of 401 residents in Ogden, Utah. Modifying the Cameron and James (1987) econometric model to fit ordered-interval data, we estimate that the mean willingness to pay for curbside recycling is $2.05 per month, and that 72% of the residents would willingly participate in such a program. Furthermore, females, young people, college-educated, those currently recycling without monetary reward, those regarding recycling as beneficial to the community and nation, and those with relatively high incomes are willing to pay the most for curbside recycling. Aadland, David M., and Arthur J. Caplan. 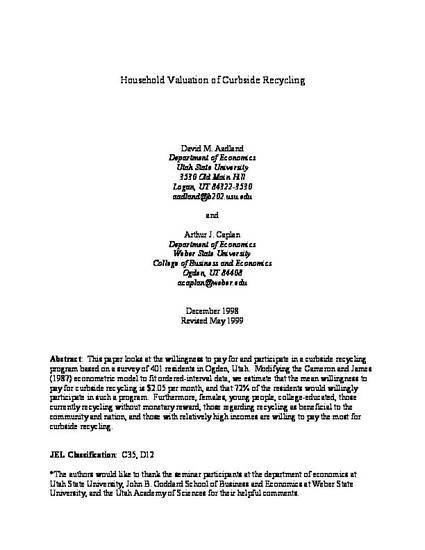 (2000) "Household Valuation of Curbside Recycling." Journal of Environmental Planning and Management, 42(6), 781-800.